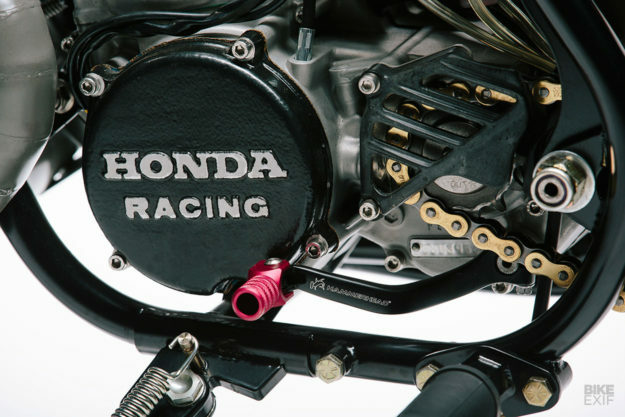 Building a custom bike for a motorcycle racer is a tall order. And the stakes are even higher when your customer is one of the fastest riders in the world. Dani Pedrosa hung up his MotoGP leathers at the end of last year, with 54 wins to his name. That makes him the seventh winningest racer in GP history, tied with Mick Doohan. 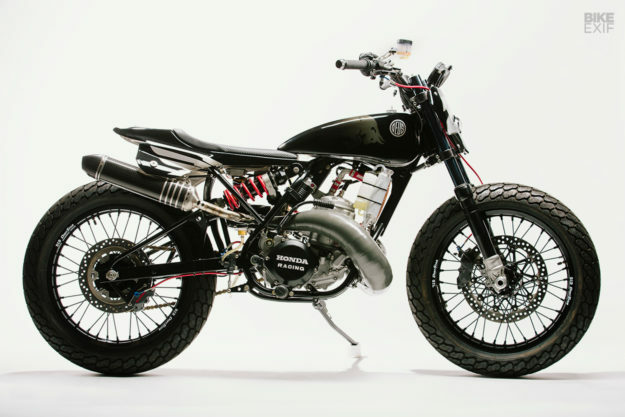 This mental Honda street tracker is Dani’s retirement present, built by Michael Woolaway in collaboration with Red Bull. 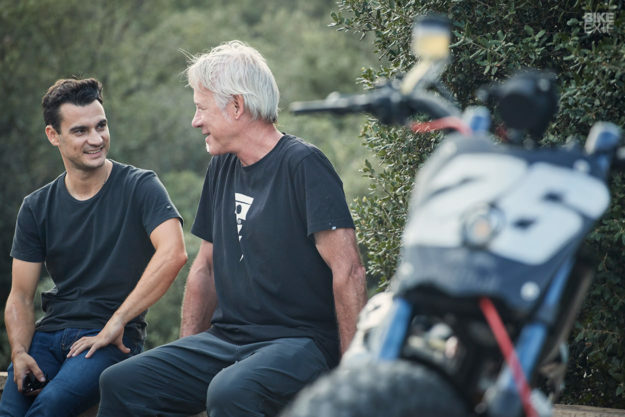 Woolie is the head wrench at Deus in the USA, and he’s big on machines that go fast: He’s currently a prepping a Ducati Hypermotard for his second entry into the Pikes Peak hill climb. Dani spent every single one of his 13 years in MotoGP with Honda, so picking a suitable donor was a no-brainer. Woolie settled on one of the most ballistic machines Big Red ever made—the CR500. 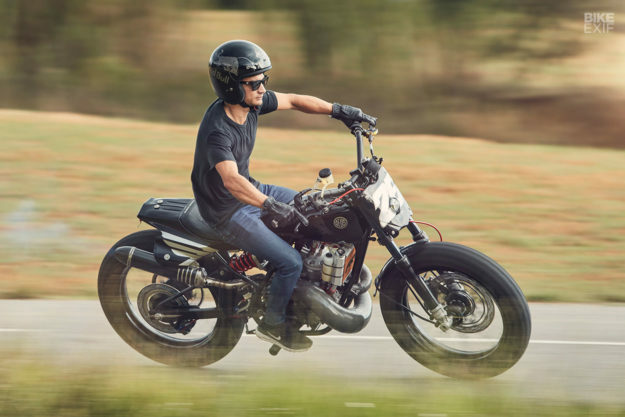 He didn’t want the whole bike though: he was just after its monstrous single-cylinder, two-stroke power plant. So the team sourced a complete 1985-model CR500, and yanked out the motor. 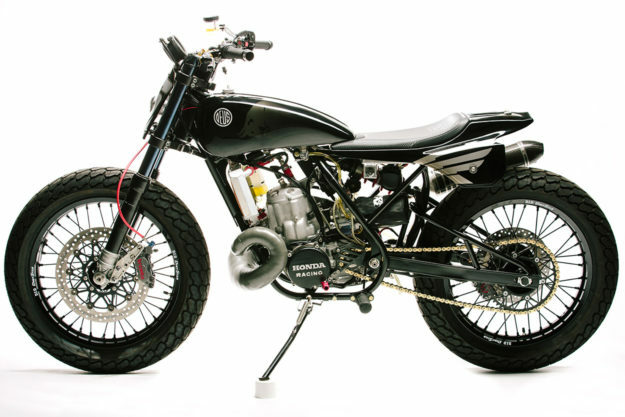 It’s now housed inside a completely bespoke chromoly frame, built by master frame builder Jeff Cole. 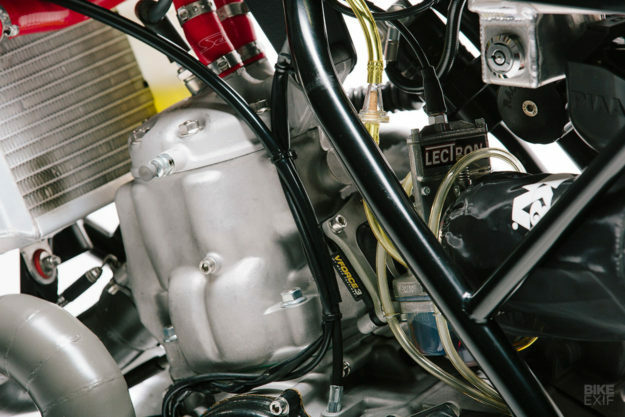 The CR500 wasn’t just known for being crazy powerful—it was also near impossible to kick start. Woolie did some research, and then decided to raise the port timing. Woolie then moved the kickstand mount nearer to the left foot peg, to give 5’ 2” Dani a solid platform to stand on when kicking it. But after bruising his left foot arch (right through his trials boots), Woolie started searching for a better solution. In the end, he added an automatic compression release to the cylinder head to solve the problem. The engine rebuild also included the addition of coils, so that Dani can run lighting. Woolie also fitted a set of old hand-sandcast HRC engine side covers, and installed a hand-made radiator from Jeff Johnson. The chassis spec is equally impressive. 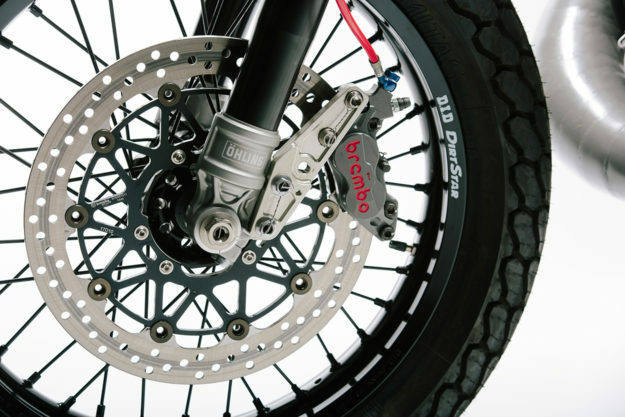 It includes Öhlins forks, held by adjustable triple clamps from Davie Durelle. Jimmy Wood rebuilt the forks, and built a custom Race Tech shock according to data Woolie supplied. 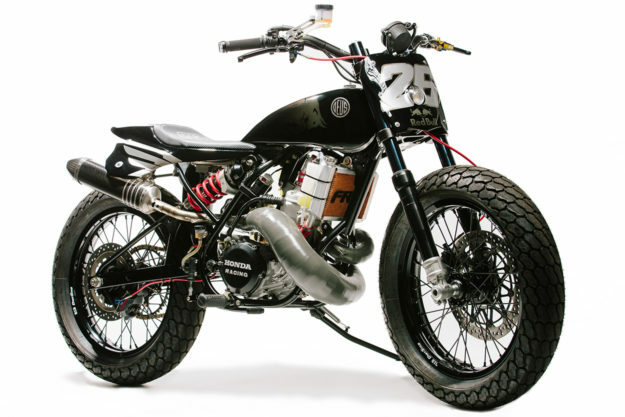 The wheels are 19” laced units, built by Dubya in California and wrapped in street legal dirt track rubber. 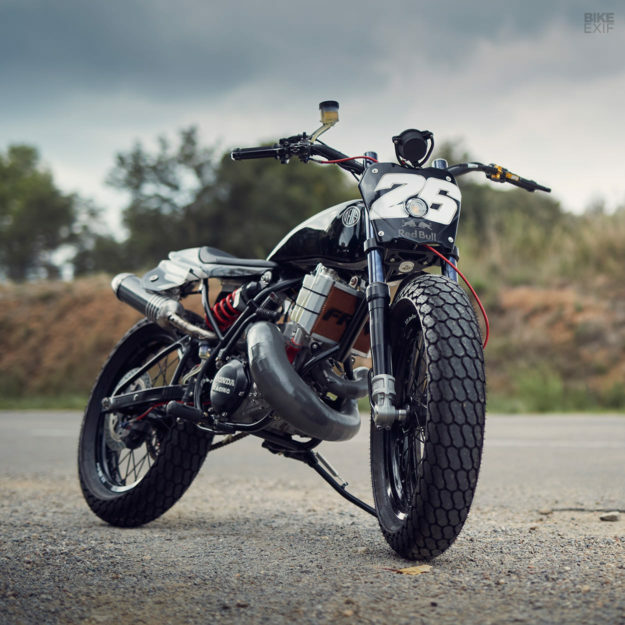 Next up, Woolie hand-shaped the Honda’s new tracker-style bodywork from aluminum. 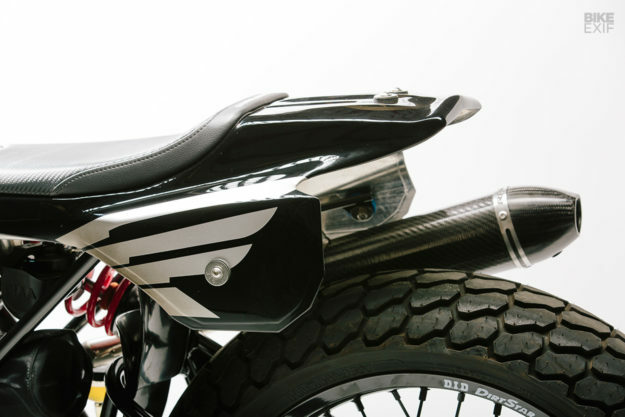 The number board, tank and tail section are all his work, and take inspiration from classic American flat track race bikes. The seat pad’s a custom job from Saddlemen, and has The Slide King’s number stitched into it. It’s a good look, and if you’re digging it, Deus have just released a poster to celebrate. 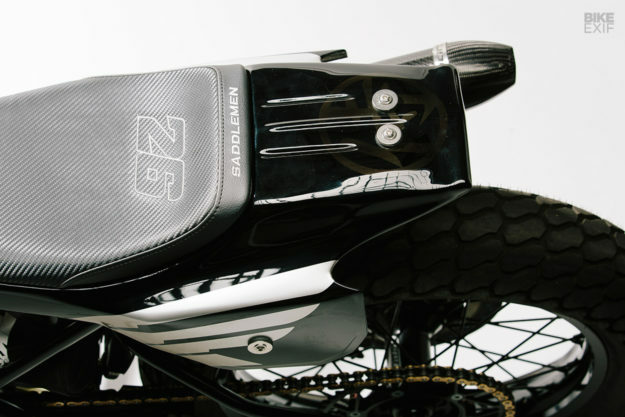 Every last part on Dani’s new runabout is top shelf, from the custom exhaust system, down to smaller parts like the handlebars, controls and brakes. And since the project started with a fresh frame and motor, all the bits and pieces in between (like the brake mounts) are hand made. The level of finish is high and the livery is beautifully subtle. All the right elements are present: Dani’s number up front, Red Bull’s logo ghosted onto the tank, and Honda’s wings on the tail section. But it’s the combination of that beastly motor and a competition-spec chassis that has us impressed…and a little terrified.